Tampa Bay is better known for its beaches than for its real estate tech startups. This might be changing. The city, which is one of the fastest growing in America (adding more than 58K people in 2016 alone), has seen a massive spurt of construction as builders try to keep up with increasing demand from millennials. People are moving to the area to take advantage of the climate, affordable housing, and growing tech scene. Tampa Bay Lightning owner Jeff Vinik is one of the leading forces behind the redevelopment and rebranding of Tampa. The renowned asset manager came to fame when he was chosen to lead the Fidelity Magellan Fund, which at the time was the biggest stock fund in the country, at the young age of 33. Now he is bullish on the city’s future and ready to facilitate a massive, vertical, mixed-use, and walkable district in the downtown area. To do this he partnered with Dreamit Ventures, an accelerator and venture fund focused on the built environment, as a source of pre-Series A tech solutions and to integrate their solutions into the $3B project. Water Street Tampa is massive in scale. Once completed, it will total nine million square feet and include two hotels, 3,500 residential units, 1 million square feet of cultural and retail space, and 2 million square feet of office space. 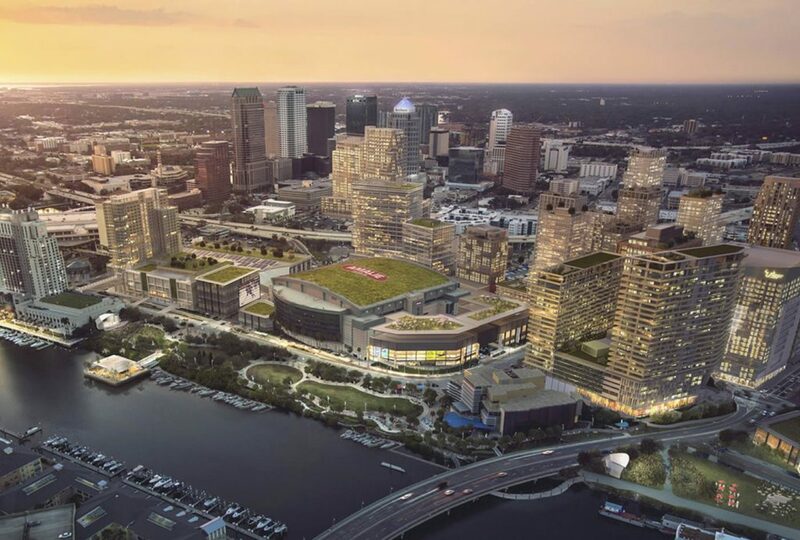 The funding comes from Strategic Property Partners whose LPs include Mr. Vinik and Bill Gates’ Cascade Investment. It will be the first ever WELL-certified district, with every building meeting the rigorous standards for air and water quality, access to natural light, and spaces that encourage interaction. It will be a leading example in America of a full “smart district” within a city. The master plan, conceived by Stantec’s Urban Places group with input from walkability expert Jeff Speck, design firm Elkus Manfredi and landscape architects Reed Hilderbrand, aims to create a true live/work/play environment. Technology and startups are a core part of the plan. To help find some of the fastest growing and most promising startups, stakeholders in the project are working with the Dreamit team, led by Managing Director Andrew Ackerman. They just announced details about their second cohort, and we caught up with Andrew Ackerman to find out more about this entirely new model for a startup accelerator. To attract founders with a product in the market, they had to create an offer that founders felt offered a fair deal. Ackerman talked candidly about some of the issues they had in their early years with trying to use a traditional accelerator model for investment, which typically means a small investment of about $50K for a significant percentage of equity in a company. So, to attract the best later stage startups, they decided to go with a guaranteed carve out for investment after the program, rather than taking a fixed equity stake upon entrance. “Now, startups give Dreamit the right to invest up to $500K in their next round of funding at a 20% discount to the terms set by their lead investor,” Ackerman said. This means that if a startup raises a $5M Series A at a $15M pre-money valuation, Dreamit has the right to take up to 10% of that round ($500K) at a $12M valuation (20% discount). In addition to the obvious benefit of ensuring a valuation that is more reasonable for later stage startups, their portfolio companies appreciate that this doesn’t force them into a valuation event when they get into the accelerator; instead, it lets them raise their next round of funding when they best see fit. When it comes to what types of technology they are looking at, Andrew put them into these categories: construction technology (AI, BIM, VR, safety, collaboration, and modular or print onsite construction), built environment (sensors for occupancy management, services for energy and water intelligence, smart controls, and embedded tech-enabled amenities), real estate tech (data providers, property management tools, space utilization, and analytics tools for brokers), and private sector-driven smart city (transportation, energy, water, waste, and urban agriculture). He noted that they are not opposed to government tech startups but admitted that the “brutally long” sales cycle makes them less attractive than their private sector counterparts. Startups in the UrbanTech program interact with some of the largest, most innovative real estate firms and construction companies in the US, including developers like Related, Silverstein, Strategic Property Partners, and Rudin, as well as construction firms like Skanska, Suffolk, and Creative Contractors. The Dreamit Urbantech model is a huge opportunity not only for the startups accepted into the program but to the proptech movement as a whole. For the built world to change for the better, corporates need to match actions with their talk of innovation. The Water Street project is a greenfield opportunity for startups to service customers, receive valuable feedback, and gain a partner in Dreamit who can help with fundraising and investor connections. Startups get the chance to prove themselves rather than just getting advice or mentoring. The Vinik-Dreamit Ventures relationship could serve as a new model for the way developers, real estate firms, venture funds, and proptech startups work together to bring cities into the future. Cherre provides investors, insurers, brokers and other large enterprises with a Platform-as-a-Service to collect, resolve, and augment real estate data from thousands of public, private, and internal sources. By providing a “single source of truth,” Cherre gives its partners a competitive advantage, helping them evaluate opportunities and trends faster and more accurately than ever before while saving them millions of dollars in manual data collection and analytics costs. IPSUM is a web and mobile app that helps construction companies implement lean construction techniques with BIM methodologies to prevent delays, avoid cost overruns, and plan projects more efficiently. IPSUM empowers workers in the field, increases compliance, generates analytics, and creates automatic reports to keep projects on track. CB Insights named IPSUM a top startup transforming the construction industry. Kognition is a hardware agnostic enterprise software solution for real estate property managers and security operators in highly regulated industries such as healthcare and financial services. Kognition’s flagship SuperGuard solution combines live security camera footage with sensor data to detect security threats such as unauthorized entrants who “piggyback” on roughly half of all authorized entrants to corporate worksites. Kognition can reduce the cost of security management by as much as 90%. myComply is the go-to platform that general contractors use to reduce their liability by verifying training and certifications of all site personnel. In minutes, GCs can deploy myComply’s free, cloud-based service to all site subcontractors creating a digital training log with up-to-date safety certifications and proof of training. TRAXyL installs optical fiber onto the surface of roads with no need for trenching. By painting fiber directly onto paved surfaces, TRAXyl delivers installed optical fiber at one tenth the install cost of traditional trenching and deploys in hours rather than months.